Not sure who said it's the most famous beach in the world, they might be getting it confused with a different beach, also located by an Atlantic Ave. But Daytona is fine, warm and has nice sand. Went to Daytona for Bike Week 2016! Also stayed at Daytona Beach Shores last October! Very nice! We are having fun with the kids, although there are no signs 2 of my boys got stung by the Man of War jellyfish on our 1st day here. Apparently it's due to the unseasonal weather, but that's part of nature. The food is amazing and there is lots to do. Daytona Beach is beautiful. Of course, it's most famous because you can drive on the beach and it's a must-try. The sand is hard-packed, so don't be nervous; just stick to the firm sand and you'll be fine. We came on Thanksgiving, so the beach was entirely empty. I hear its normally packed, and it's more like a traffic jam. I think that would less enjoyable, so come on a holiday to have some serenity. You'll see plenty of cool classic cars on the beach that make for great photo ops, so don't forget your camera. Roll down the windows and take in the cool fresh air and soak up the lifestyle. This beach has the allure of driving right into the beach! If you in the offseason, you normally don't have to pay to park like you would on summer weekends. It is on the Atlantic so it's going to be on the cold side. The sand is also packed as they don't rake it like pretty much every other beach every else in the world. So you won't see fluffy sand dunes but you also won't have as much of the sand sticking to places. If you have small shovels its super easy to build sand castles though as the sand is super wet. You can relax towards the back by your car or head out towards the water. There's a boardwalk, and a few hotel bars along the way (I recommend Oasis Tiki Bar) There are tourist trucks along the way to buy souvenirs or to get food and drinks. The "road" is one way and sometimes you can drive down the beach for quite a while before you find an exit. Just be aware of people and traffic but its a great stop, and not too far of a drive from Orlando for the day. The most fun I have had at any beach here in Daytona. I love this place and would return time and time again. 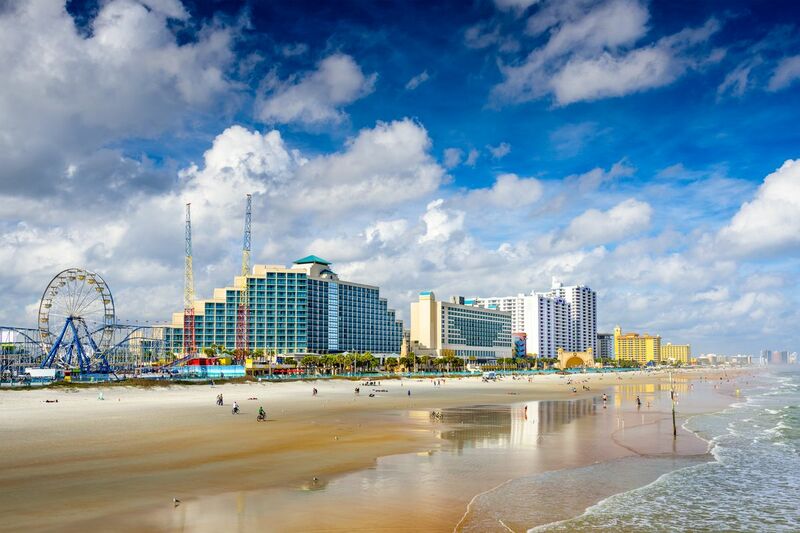 Always fun at Daytona Beach whether relaxing on the beach or at Daytona International Speedway or Bike Week. Not the best beach. You are better off going to the beaches in the panhandle of Florida!